For English Language Arts (ELA) professional development to be effective, it must lead to instructional change and student achievement in the classroom. But what takes professional development beyond simply training to something truly transformational? 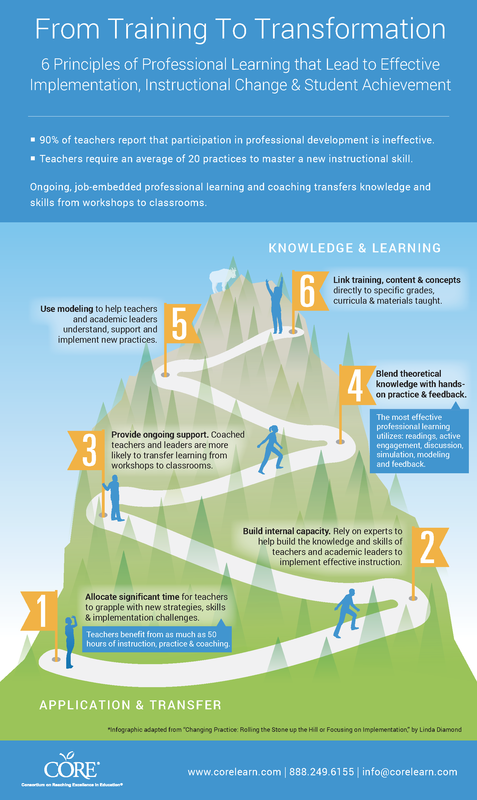 Our infographic, below, outlines the six key principles of effective ELA professional development. Look for these qualities when selecting ongoing, job-embedded professional learning to support literacy and ELA teachers. For more information about how to provide literacy and ELA teachers with professional learning support that leads to full implementation, instructional change and student achievement, fill out the form to read a white paper from CORE President Linda Diamond.